Howdy folks. Today I'm serving up a platter of Chocolate Chip Muffins. A couple weeks ago Tanya from Dreams Diapers and Dilemmas posted a Pumpkin Chocolate Chip Loaf. It totally grabbed my eye and sent my salivary glands into hyperdrive. last week when out of the blue my boss brought in a recipe for Pumpkin Chocolate Chip Muffins. And it wasn't any recipe. It was from an old book that had seen better days and had pages falling out. That's how you know it's good. So, I immediately made a photocopy. You must know that this lady is THE next Martha. She knits, she sews, she decorates, she runs her own business, she bakes. There is not much she can't do. And it is all done to perfection. I have many of her recipes in my repertoire. And when she says something is good, you best try it. Unfortunately I didn't have the pumpkin spice on hand, so I had to improvise. She says that the spices were stronger in hers. Mine were also a little on the dry side. Perhaps it might have helped had I covered them promptly last night. So, I'm off in search of the holy grail of Pumpkin Chocoloate Chip Muffins. It may take a few attempts, but I will find it. But if the kids are any indicator, they must have been pretty tasty. It's all I can do to save just one for hubs. If opting for almonds: Put almonds on a baking sheet or pie pan and bake about 5 minutes, just until lightly browned; watch carefully so almonds don't burn. (You can also toast them in a toaster oven.) Slide almonds off the baking sheet so they cool quickly. Grease muffin cups, or use foil or paper baking cups. Thoroughly mix flour, sugar, pie spice, baking soda, baking powder, and salt in a large bowl. Break eggs in another bowl. Add pumpkin and butter, and whisk until well blended. Stir in chocolate chips and almonds. Pour over dry ingredients and fold in with a rubber spatula just until dry ingredients are moistened. Scoop batter evenly into muffin cups. Bake 20-25 minutes, or until puffed and springy to the touch in the center. Turn out onto a rack to cool. Wrap in a plastic bag and keep for 1 or 2 days. Reheat before serving. You really can't go wrong. If you are in need of a yummy treat, this may be just the thing. Have you been doing any baking? What are you cookin up these days? Did you notice my anniversary tulips (in the photo at top) that hubs must have paid a fortune to find this time of year? Would you be interested in doing a guest post for one of my Tasty Tuesdays? If so, leave me a comment or email me at lish@mchsi.com. If you have one to share this week grab the button and link up. Happy eating!! I'm off to a school concert. Have a good one. I have never heard of pumpkin choc chip muffins! Looks yummy! I love pumpkin...especially muffins! I love a good pumpkin muffin. Pumpkin and chocolate? Perfect. Thanks for sharing! I was debating on whether to link up with the tofu parmigiana I made tonight (for the first time) or the chocolate chip pumpkin bread I made this afternoon (also for the first time)...then I saw your post! Great minds think alike :) Guess I'll be going with the tofu parm for Tuesday! These are one of my FAVORITE fall treats!!! I totally need to make these now. PS I love all your cute fall sweaters. Your muffins look wonderful! I really wish I had one right now. Thank you so much for sharing your recipe and hosting the party! Looks super yummy! Totally going to make those! I want one of those muffins right now...they look perfect! Thanks for the mention..you're the best :) Happy Tasting! I shared your tasty tuesdays link with a friend of mine because her 6 year old daughter who loves to cook and her have started a blog called "no easy bake ovens". adorable!!! btw, have I mentioned how damn cute you are??!! I can't wait to try these, they look wonderful and I love anything with pumpkin, chocolate is icing on the cake! Yummy!! I love the combo of chocolate chip and pumpkin!! For some reason I still haven't tried making these oh-so delicious sounding muffins. Thanks for posting them! Those muffins are gorgeous. I love pumpkin recipes in the fall and, of course, a little chocolate is always a welcome addition. They look gorgeous, but we don't have canned pumpkin in Oz (as far as I know). Is it simply mashed pumpkin? I put the wrong title on my thumbnail - duh! The one that reads life lessons (which is what the blog ends up being about while I had a mishap with cake) should be titled "Beat Up Butterscotch Peach Cake"
Those muffins looks great! I have a recipe that is similar and I haven't made them in ages. Must try yours! these look so yummy...i am going to pick up the ingredients at the grocery store this week! i have made spice cupcakes with cream cheese frosting and they were oh so good! Those muffins look like they're perfect out of the oven - all that gooey chocolate...yum! I'd love to do a guest post for you anytime! Just found your blog. What a wonderful blog hop! I linked up with some Peanut Butter-filled Chocolate Cupcakes I recently tried from Martha Stewart's Cupcakes book. They didn't turn out as I had hoped, but with a little tweaking I think they could be something special. Love, love, love pumpkin muffins!!! Linking up a yummy recipe for mint brownies - a cross between a friend's recipe and Bittman brownies. This is one of my fave bloghops - thanks so much for hosting every week. I've found so many good recipes, and enjoy sharing my own too. I'd love to do a guest post if you like - you can get in contact with me through Blogger. I'd love to guest post if needed! 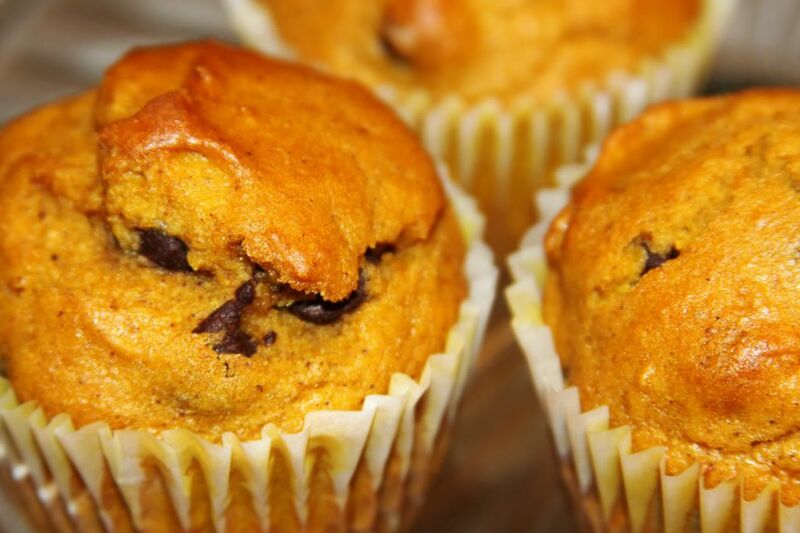 I have a pumpkin choco chip muffin recipe too - these last 5 minutes at our house! your Pumpkin chocolate chip muffins look so yummie! I love all the recipes you shared. How are you? I hope everything is alright! Hi Alicia! You were one of the bloggers that inspired me to try making a recipe card. 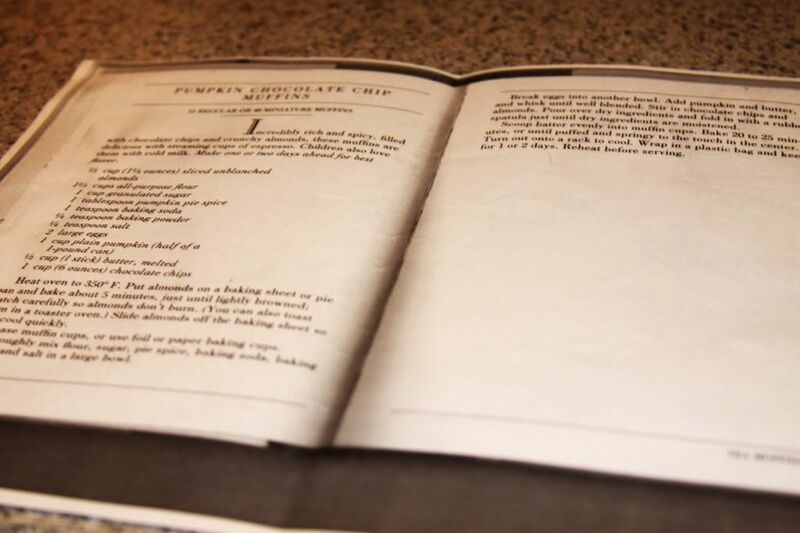 I have been enjoying printing out all these recipes from you and many others. Thanks for hosting again this week! 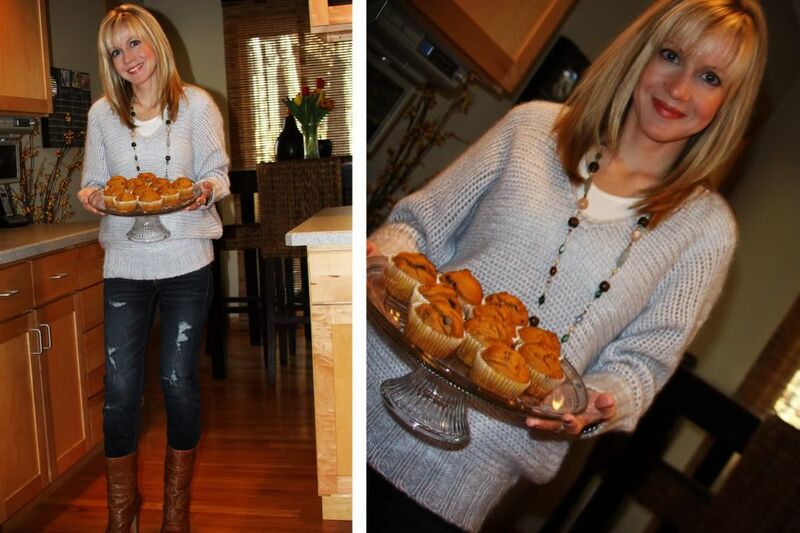 You look too cute for words and those muffins look DELISH!